This is a popular parking sensor system because it’s a clip-on mirror with an embedded LED strip that will do everything that our slim display does. But it will clip over your existing mirror and will look stock in the vehicle. The mirror itself is made of very high quality and will look like a regular mirror even when the sensor system isn’t activated. when you put your vehicle in reverse the speaker built into the mirror will start to beep when there is an object 8ft away and the closer you get to the object the beeping will get faster and faster until it “flatlines” 6-inches away from your bumper with a solid beep. The TadiBrothers radar technology had been used on the road for over 10 years from a small Ford Focus to large semi-trailers, we keep everyone safe. When designing these displays we had the aesthetics of your vehicle in mind, we made it so that when its clipped over your existing mirror it will look stock in the vehicle. Imagine you’re maneuvering into a parking spot. What could be easier than looking at your rearview mirror and seeing a gauge with your distance to an approaching object? The mirror included with this color mirror dual parking backup sensor system with sound has a built-in sensor display. In addition to the distance shown, you’ll also see a color meter that will light up in different colors, depending on how close you are to the object (red means stop, yellow means caution, green means go). An alarm will sound as soon as an object enters the detection zone, increasing in intensity as you get closer. You’ll never swipe another car while parking or sitting in bumper to bumper traffic again. This system comes with 4 sensors, but you can upgrade to 8 sensors if you want your entire vehicle covered. You can choose the color of the sensor and even match it to your car. We have standard colors such as black, silver and gray, and even more exotic colors like metallic blue or lime green. These sensors will withstand all types of weather, so there’s no need to worry about hazardous weather conditions. 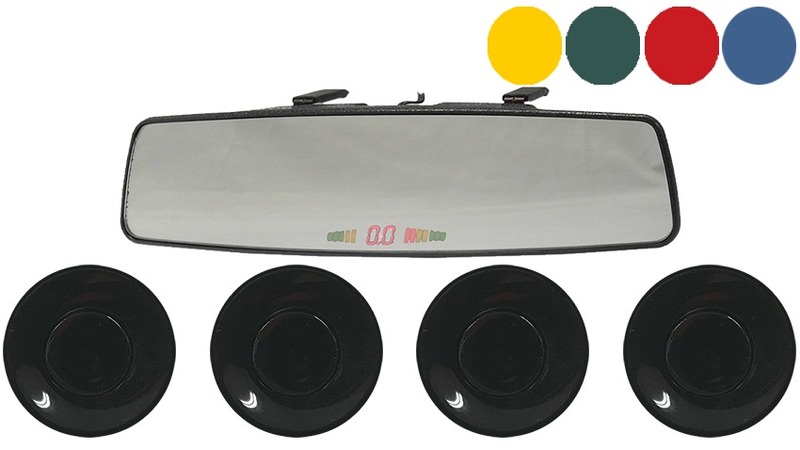 Purchase this color mirror dual parking backup sensor system with sound from Tadi Brothers and make your commute stress free, once and for all. Pick the 8 sensors option and then you will have your entire car protected by sensors. The sensors are also painted with a high quality car paint that will stand in all weather conditions and it will look great installed on your bumper.